No matter what side of the Kris Russell discussion one is on, there is no debating as to whether or not he is a viable NHL defenceman. Despite the shortcomings in his game, the 30-year old showed once again he could help a team as a depth piece during the 2016-17 campaign. However, this notion that the Edmonton Oilers are in some kind of dire need of re-signing the Red Deer native is not only confusing but flat-out untrue. Yes, it is no secret Peter Chairelli is a fan of the player. Ever since inking him to a one-year deal late in training camp, he has gone out of his way to speak in nothing but glowing terms about the veteran’s game. 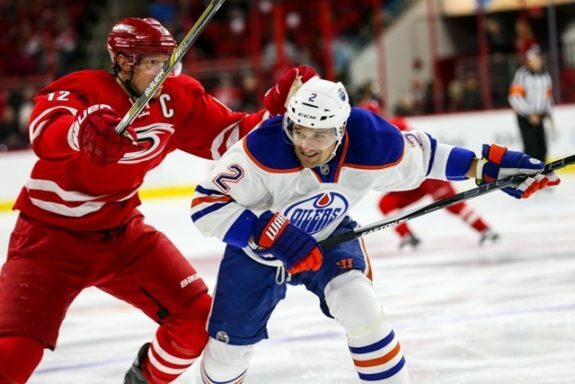 There is no question his experience, coupled with the addition of Adam Larsson and a healthy Oscar Kelfbom played a big part in helping the Oilers turn things around as quickly as they did. With that said, let’s not be silly here. Of the trio just mentioned, it was Russell who had the least significant impact of the three. Not to mention an improved Darnell Nurse and the pleasant surprise that was Matt Benning. Make no mistake, the improvement on the backend was a collective effort but it also benefitted greatly from the stellar play of netminder Cam Talbot. Add to that the emergence of Leon Draisaitl, extremely productive campaigns from the likes of Mark Letestu and Patrick Maroon, the simple presence of Connor McDavid and a lineup that stayed relatively healthy throughout the year. This organization had a lot go their way in 2016-17, including a favourable schedule to open and close the season, and it was frankly overdue for some “non-lottery” luck to fall on their side. Obviously, the absence of Andrej Sekera to start the 2017-18 season creates a major hole along the Oilers blue line but how exactly does keeping the former Medicine Hat Tigers standout in the fold address it? As of this moment, Edmonton has two top four defencemen in Klefbom and Larsson. The notion of Russell being included on that list is both inaccurate and downright foolish. Let’s not forget, the former third-round pick of the Columbus Blue Jackets was at his best when paired with Sekera. As that will not be an option Todd McLellan will have at his disposal for much of the coming season, finding a spot for Russell inside the top four becomes rather problematic. Benning showed flashes of being able to carry said load as well but he too played his best hockey when skating alongside the Slovak rearguard. The idea of a second pairing with two of Benning, Nurse and Russell should scare the heck out of Oilers fans everywhere. One would think to find a defenceman who is actually equipped to take on the responsibilities Sekera was asked to deal with on nightly basis would a top Chiarelli’s offseason to-do list. If the general manager can accomplish that, the only way Russell makes sense for this club is on another one-year deal. From the player’s perspective, such a move would be a worst case scenario only, just like it was a year ago. Unless the front-office team was to panic and make a poor decision, there is absolutely no way such a move happens. Does Chairelli have a genuine interest in bringing Russell back? I believe he does but he also realizes giving multi-year deals to depth players is something this organization can ill-afford to do. With Leon Draisaitl and Connor McDavid set to make major dollars in short order, mistakes on dime-a-dozen guys is something that cannot happen. The Edmonton Oilers are in no position to take such unnecessary risks and Peter Chiarelli is well aware of this. Which is why all this noise surrounding the future of Kris Russell is so perplexing. Despite what some might have you believe, we are likely talking about nothing more than a backup plan for the organization and it should be viewed as exactly that.